Today I decided to see the new movie adaptation of Stephen King’s Pet Sematary. I haven’t seen the older film or read King’s novel, so I went in more or less blind, armed only with the knowledge of what has been presented in the trailers. Adaptations of King’s work are numerous and, as such, their quality varies greatly. 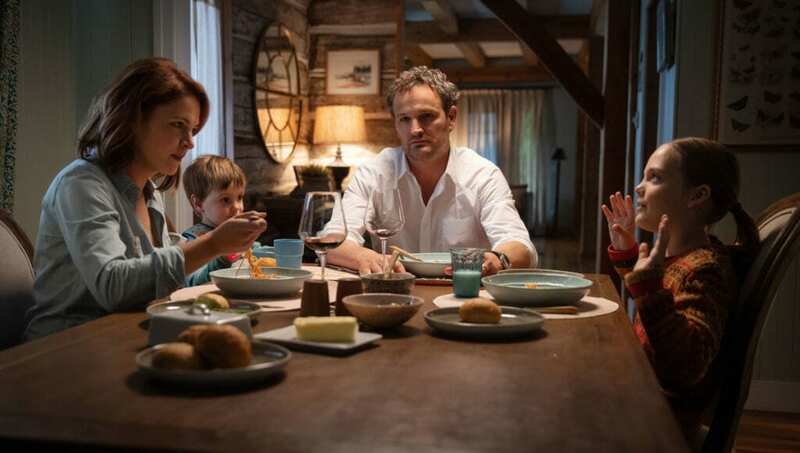 My husband is a big Stephen King fan, and I was automatically interested in Pet Sematary thanks to the presence of actors John Lithgow and Jason Clarke. As I have not read the source material or watched the other movie version, I’ll be evaluating Pet Sematary on its own terms and not as an adaptation or remake. Let’s see what we got. Pet Sematary centers on the Creeds, a family who move from Boston to the rural Maine town of Ludlow. Once they arrive, things get weird rather quickly. Father Louis (Jason Clarke) and their neighbor Jud (John Lithgow) find daughter Ellie’s (Jeté Laurence) cat Church dead on Halloween and decide to sneak off that night to bury him. At first, Louis is ready to bury Church in a regular plot in the Pet Sematary behind the house. But Jud knows about another place farther into the woods that can do more than just hide the evidence of Church’s demise; the cat is resurrected, but he isn’t quite right. Ellie is thrilled to have her pet back, but he isn’t as loving anymore, and he has a newfound mean streak. The family’s tragedies don’t stop there, and before long things are well out of hand for Louis and his family. Pet Sematary has a lot going for it. It’s got an interesting visual scheme with a diverse color palette, and I like the musical score by Christopher Young. This film excels at creating an unsettling atmosphere, and while I’m usually opposed to jump scares, there are a few genuinely effective ones present in Pet Sematary. On a technical level, the filmmakers have a fantastic sense of when to go for scares and when to go for lighter moments. Jeté Laurence also gives a solid performance as the young Ellie, and John Lithgow is really enjoyable as Jud. However, I didn’t love Pet Sematary, and it’s not a perfect movie by any means. The elephant in the room, at least for me, is Louis. He’s the film’s principal character and makes most of the important decisions, so it’s crucial that the audience feels invested in him and his family. I like Jason Clarke very much as an actor, and after his turn as Ted Kennedy in last year’s Chappaquiddick, you can count me as a fan. That being said, Clarke isn’t good in Pet Sematary, and I’m rather disappointed. As other characters come back from the dead, he acts the most like a zombie out of the bunch. It’s not all his fault, though. Amy Seimetz is a little better as his wife Rachel, but she’s not amazing either. We don’t learn much about Louis, or any of the characters for that matter, throughout the film’s runtime. It feels like the Creeds don’t bond much as a family, and their connections don’t shine through to the audience. As such, it’s difficult to care too much about them. If you’re going to show a character making these morally dubious choices, it needs to feel sympathetic. Obviously, the audience knows more than the character and will realize that he’s making the wrong decisions. But emotionally, it needs to resonate that he feels like this is his only choice. It never feels that way because we don’t have the opportunity to know the family and their relationships that well. What a shame. In Pet Sematary, time that should have been devoted to said characters and their development instead goes to a backstory involving Rachel and her late sister, Zelda. I understand that this is a scary movie, and those are scary scenes. However, thematically and in terms of character development, it feels like these flashbacks don’t really connect with the current timeline. Again, I haven’t read the book or seen the other movie, so it’s entirely possible that this storyline is more effective in one of those. One could even argue that Zelda being twisted physically relates to characters being twisted in a supernatural sense, but it’s hard to say if Pet Sematary is even making that point. As is, it feels like misplaced focus and wasted screentime. Why show us so much about how Rachel feels about her dead sister, who has nothing to do with the story, instead of her relationships with her living family who star in this movie? One overarching theme in Pet Sematary seems to be parents and the bad, sometimes disastrous decisions they make. Rachel’s parents left her to care for her sister, and this has terrible consequences for which she guilts herself. Rachel tries to shield Ellie from the realities of death and wants to straight-up lie to her about what happened to her pet. One could also argue that she and Louis are making a bad choice by keeping the kids there once it becomes abundantly clear that there’s something wrong with the area. This might be more of a stretch, but you could even argue that Jud is something of a paternal figure and the movie’s big disaster can be attributed to his decision to show Louis where to bury Church, rather than to leave him to put the cat in the Pet Sematary. Speaking of church, based on the ads for this film I thought he would be more present. He is extremely creepy, and I love his look, but he feels underutilized. Again, I might have taken some of that Zelda flashback time and given it to Church. I hate to harp on, but that feels like a misuse of time in a 100-minute movie. Finally, I don’t really like how this film ends. It’s not the nature of the ending in terms of content, just that I dislike the abruptness of it. I realize that this was intentional on the part of the filmmakers, and you’ll know what I mean if you’ve seen it. But I dislike it, and it left the film feeling incomplete to me. Overall, I enjoyed Pet Sematary, and I would say that it is a serviceable film. However, I won’t be rushing to see it again any time soon. It’s entertaining enough for a watch, but I don’t feel like it will be strong enough to hold up to rewatches. I would probably recommend this movie to big horror buffs, Stephen King fans, and anyone with relatively low expectations. This is a movie you’ll probably enjoy if you can turn your brain off for a couple of hours. I enjoyed Pet Sematary and I would say that it is a serviceable film. However, I won’t be rushing to see it again any time soon. It’s entertaining enough for a watch, but I don’t feel like it will be strong enough to hold up to rewatches. I would probably recommend this movie to big horror buffs, Stephen King fans, and anyone with relatively low expectations.